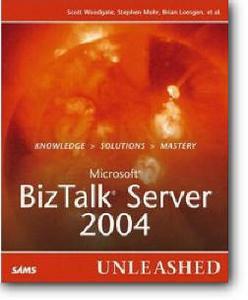 Microsoft BizTalk Server 2004 Unleashed is your tool to unleash the power of Microsoft's BizTalk Server 2004. Learn how to use the server as an enterprise application integration tool and how to exploit its key strengths to orchestrate e-commerce business processes in B2B and B2C environments. Providing complete coverage of system architecture, application integration, messaging and migration, Unleashed also illustrates practical application of the server through an entire section dedicated to real-world case studies of businesses using BizTalk Server 2004 on a daily basis. As seen in these examples, there can be obstacles along the way to success, but Microsoft BizTalk Server 2004 Unleashed will help you overcome each one.